The event features the most recent developments in safety and quality processes in the F&B industry. Amidst an array of prominent keynote speakers Bruno Adam and Robert Brooks of Omron addressed attendees with an interactive presentation about the benefits of autonomous vehicles in food production. 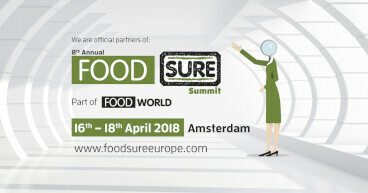 AMSTERDAM (NL), 23-05-2017 - The historical building of Hotel Krasnapolsky in the picturesque centre of Amsterdam is the venue of 7th annual Food Sure Summit. The event features the most recent developments in safety and quality processes in the F&B industry. Amidst an array of prominent keynote speakers Bruno Adam and Robert Brooks of Omron addressed attendees with an interactive presentation about the benefits of autonomous vehicles in food production. Where will we be twenty years from now with regard to automation in F&B? How safe is a production line when sensors get dirty or malfunction? Why does Omron's AIV, the LD-robot, look like a toy and not very industrial? We have AGV's at our factory. What is the difference between an AGV and AIV? What kind of clients does Omron work for and do you have a F&B robotics example with regard to food safety?